Many of us are gearing up for the new season, which often means having to break in a new pair of football boots and that can literally be a pain. 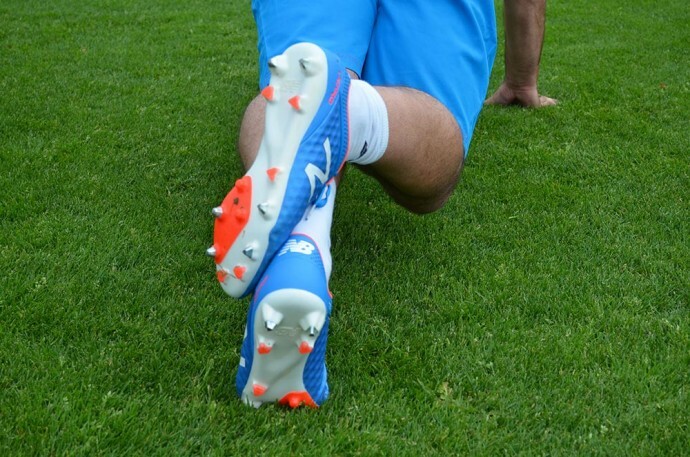 This top 10 guide, will help you and your football boots perform better, sooner, and help reduce susceptibility to injury. You know what it’s like. You need a new pair of football boots, but with a new pair of boots you may have to go through pain to break them in. New football boots can mean sore feet, that is until the new football boots and your feet get used to each other. Even if you are dusting off last year’s equipment, your feet and football boots may need to readjust to each other again. Fortunately, many modern football boot materials are now softer than they used to be, reducing the time needed for you to ‘break in’ your new football boots. Even so, it’s highly recommended that you follow this guide as injuries can happen and who wants to be sidelined due to a new pair of footy boots? 1. Ensure that your new football boots are the correct size for you, considering length and width. A wrongly sized football boot is a sure fire way to injured feet. Forget rumours of professionals wearing a size too small, specialists confirm that football boots that are too small for the foot can lead to injury. 2. Before wearing new football boots, rub Vaseline on all of the contact points on the foot that are susceptible to blistering, such as your toes and heel. This will help reduce friction against your skin and help prevent blisters forming. 3. Where possible, try wearing your new football boots to walk around in naturally, without exerting pressure on your feet like you would do in game conditions. Walking around the garden or a local park in your new football boots can help your foot and boot get used to each other and you may spark a new fashion! 4. Gradually introduce the new football boots during training sessions. Start by aiming for a maximum of twenty minutes of play in your new football boots. Should you start feeling any pain, then change the football boots immediately. 5. Continue wearing your football boots in training for progressively longer spells, or until the football boots feel very comfortable. 6. If you feel like you are struggling to break the football boots in, try dampening the upper slightly before using them, but don’t soak the boot. Also, don’t use very hot water as this can melt the adhesives used on the football boot. Dampening them lightly with a sponge should do the trick. 7. After using the football boots, clean any debris or dirt off of the football boots with a soft brush or sponge. 8. Stuff the football boots tightly with newspaper after use, or use a shoe stretcher. This will help keep the football boot in good shape and will help dry the moisture out of the football boots. 9. Let the football boots dry naturally after use, so keep the football boots away from heaters and direct sunlight. 10. If you continue to have problems breaking in a new football boot, even after regular short intervals of using them, you may have to consider replacing them. Do you have any tips to share on how to break in new football boots? If so, please share your advice in the comments section below. In the first step when you soak your football boots should I pull out the insoles? as well how long should i soak them for? 20 mins? The vaseline trick works for me every time. The other thing that helps is getting blister plasters. They are really thin and stick to your foot very well. It feels like you have an extra thick layer of skin on your heel. Do you put the vase line on just before a game or just at home? My kids wear waterproof football socks even in the summer. When they get their new boots for the season they never have a problem with blisters or sore feet. Something to do with how the fabric takes sweat off the skin so that the foot stays dry. where do you get waterproof socks from? Also any one know the best way to clean leather boots to keep them looking new. I find that a small pair of ‘trainer’ socks worn underneath your football socks can help considerably. They can be picked up from supermarkets such as Asda and Tesco for around Ăâ€šĂ‚ÂŁ2, and are normally so thin that you barely notice the extra layer. This all works on the principle that the trainer sock moves with your foot, and the football sock moves with the boot, eliminating friction from being directly applied to the skin of your foot, which is the source of the usual breaking in pain! not to push a product, but adidas predator powerswerves (properly sized) are fine out of the box. No matter what I do my pair of mercurial vapor 4 I can’t break in them, I gave up on them and went back my old pair of Lotto’s. For leather football boots, dump some newspapers with alcohol and stuff the boots with it, that helps loosen up the leather. Hey Splinter09, I thought the same when I got my vapor 4’s, I had huge blisters for around a month. What did it for me was placing band-aids on the spots where I got blisters and then covering the band-aids (often multiple)with athletic or physio tape. I did this for another month and ever since that they have been fine. Honestly you just have to play through the pain for a while, but once they are broke-in it is worth it, at least that has been my experience. All the best with your football this season. totally agree it happen to me with MV III, IV AND V FOR REAL!! yeah i had it happen to me for the Vapor V but i was fine with the Vaper IV. a much easier solution would be to pick up a product called molefoam. it helped me considerably when breaking in my vapor IV’s. also I”ve recently purchased a pair of vapor V’s and they gave me absolutely no problems out of the box. Hey Mitch 101, u know what, it was wierd when I got my mercurial 4. They didn’t give me blisters at all. A trick is to wear double or triple socks, and then rub Vaseline on the pressure points. And I had a problem with my mercs. They are ripping on the soles and stuff, like near my toes and under the balls of my feet. I paid good money for these cleats. Anyone know of a really good adhesive that could glue my cleats back. Super glue doesn’t work. And if u do know of anything, can u make sure I can buy it in Alberta, Canada? Every Predator I’ve owned I’ve been able to wear right out of the box without a blister. Other boots however Besides predators and Copa Mundials that I’ve had to break in I found wearing them in the shower and just having a warm, not hot shower, then stuffing them full of newspaper to dry them has worked wonderfully. Mind you I’ve also tried kicking a ball around in the rain for 20 minutes then stuffing them with newspaper to dry has worked just as well. This works with Leather and K-Leather, I’m not sure how well it would work with synthetics. Is that Wayne in the first picture? Nike’s generally are half size smaller for me. And I have heard this from other people too. E.g. I wear 11 adidas, but have to buy 11.5 Nike to get the same fit. Although, it goes to the width only. Since F30s are usually synthetic, and have a more narrow fit, I would say get 11.5 predators, because they are wider generally, and K-leather will stretch. As far as the general topic, the best pair of boots so far for me has been the original adiPure. I wore right off the box – no blisters, etc. Looking to buy Predators next, and would like to know if anyone has had both, and what is their opinion. i have Predators and adiCores (the next one down from Pures). they are the same size but i have to double sock when wearing the predators however after doing this i could literally wear them straight out of the box. i would say that the cores don’t actually “break in” as easily as the preds because they are made from an inferior leather (ULT-K leather, look it up if you want) but they are more comfortable and provide a very tight and secure fit because of their unique collar design thingy. they also have more leather than the preds so it moulds to the shape of your foot much better. matt: get the 11.5s…if they are k leather. i wear 12s normally as well, and pretty much any k leather boot ive bought i got in 11.5s. they will most definitely be tight at first, but with proper break in they will stretch to create a perfect mold of your foot. also, it seems your dominant foot might be a touch longer than your other foot, mine is as well. my right foot is like a 12, and my left is like a 12.25. i would still get the 11.5s, but just consider your dominant foot might take an extra bit of stretching. FYI the shower trick really works, i have some legend 2s i bought in 11.5 that were VERY stubborn and took a very long time to stretch. they felt really tight for a while…then i wore them in the shower with luke warm water and wore them till they dried. had to do this 3 separate times, but now they fit perfectly. they definitely would have given me blisters if i played in them right out of the box, so i just did a shower trick a few times and just wore them around the apartment and now they are fitting excellently. awesome advice. thanks and if u have leather boots get them wet and go run like along time to get the leather softer and then once ur done put newspaper in the shoe to get the wetness of the boot out! hope this helps! I am getting The Verminator boots, yeah ! They are awesome, predators are the best boots you can get, they are comfortable and they last much more than other boots. i currently wear the adipures and my 2nd choice are predators,i play right mid and im tempted to buy the new black and yellow vaopurs. i have worn vapours before and had no trouble with them but they were an older verson and will be diffrent from the new vapours had any had a promblems breaking in to the new vapours? well the way i do it to break into dem is by running with them, juggling the ball alot and take shots..dont play 90min tho! I have a brand new pair of Adidas Predator Absolions. size: 11 1/2. I’m replacing my old Absolions, also 11 1/2. I notice that the new ones are a bit tighter especially on my right foot, (toe especially). I don’t recall how tight my old ones were when first worn and am wondering, how true to size they are making them now. Im not sure if I should send in for a 12 or break them in! Anyone familiar with the Predator line, please inform. Thnx. before i put my boots on, i shake talkin powder on my feet then rub it in. then put vasaline on the ankles, toes and the back of your foot. then i put thin socks on. then i put talkin powder over the top of them and rub it in. and then i put my football socks on and then my boots. At least for me, Nike’s Air Legend II’s have been fantastic – almost like slippers. Extremely comfortable. No blisters, no hotspots, nothing. Unfortunately, they’re now difficult to find. hi all – Im an australian rules football player senior player with some experience. One technique Ive heard many ppl swear by is to dampen newspaper and stuff it into the boot and leave overnight. Then take it out and allow to dry before wearing it in as described. i just brought pair black superflys i been wearing them for 1 half every game 2 break them in bt rather then get blisters the bottom of my foot starts 2 hurt the more i run any ideas why? I got a Puma v-kon iii (entry level) for a match shoe. Unfortunately, the pair that was bought for me is 2 sizes bigger rather than 1 size. Now,I have to bear with it and think of a way to break it properly while avoiding injuries. i’ve generally always gone with predators & never had any issues with them. could wear them straight out of the box. my new boots are adipure though, & they gave me bad blisters on the back of my heels – especially my dominant foot – the first time i wore them. will try the vaseline trick & see what happens. @ Big Dave i also wear adipures and the heel is hurting me on my left foot (my dominant foot) so i just wear a thin layer sock under my boots and then lightly soak my football boots after use. Rub the vaseline on your boot and your foot, also your socks. 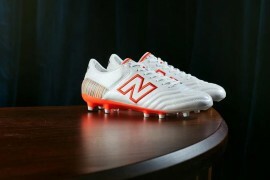 I just got some of the T90 Laser III’s , red/white. I am a goalkeeper and found when having a pre-season (New Zealand) kickabout with some friends that they felt really sore around the outside edge of my right foot, they are not leather, so do you reccomend that I wear these in the shower or something? The pain was unbearable therefore I had to change boots. This happens alot with my football boots as I have wide feet, but it dyes down after a few uses. Agree with @Daire, the Vapors do take an age to break in. definitely! ive had vapours since the first ones and the latest superfly 2’s r the most difficult to break in, 1month down the line and am still getting bad blisters! i havnt tried vaseline yet though! im also getting superfly 2’s… will the shower method be a good idea with cleats that expensive?? I recommend to gel insoles as they help a lot. i want a pair of CTRs and i was wondering if i can use bootcream on them as they are synthetic? Â you can but it wont do any good, unless its like a polish to make them look nicer.Â Like putting a protective wood-stain on plastic siding. Go To This Web Site www sportsdirect com/dunlop-perforated-gel-insoles-750581?colcode=75058199 There Real Good I Got Them in my cr7s. football boots are designed to be comfortable for 90 minutes. Always put a leg of your bed into the heel of your boot so that the boot is pointing upwards. Keep it there 24 hours a day for 3-4 days and this will stop any blistering on your heels. with mercurials the hot water trick; are you meant to wet the inside with warm water and wear them straight away while they are wet???!?! If you want a pair of boots without blistering, get copa mundials. If you do decide to buy another pair of boots wear them in a warm bath standing up and moving around for 15 mins. For further protection before the game. I wear a pair of ankle socks over my football sock and cover it in Vaseline . Tie your boot tight so there isn’t too much movement for your heel to slide up and down also! Pingback: Egg Head Answers – How can I break in synthetic football boots? Vaseline to prevent blisters? – Put you socks on your feet. Now before putting your boots you generously apply vaseline to the heel area over the top of your sock. Also apply to any other part of the sock where the boots also tend to rub or create soreness. Use plenty of vaseline don’t be shy guys the more there is the less friction there will be! I would also like to quickly say that it isn’t just the brand that affects the sizing it can also be the boot type. For example I wear Adidas Predators (size 8.5), Any Nike boots (size 8.5 is too big, 8 is too small), Puma ‘spped’ boots (size 8.5), Adidas Copa Mundial (size 7.5 and I’m currently trying a size 7). Once you find a brand or spcific style you like then stick to it. This will also assist in keeping a comfortable boots and preventing foot injuries. My feet are a mess but over the years I have built up a few different techniques that work! I have played in the South Conference football league but now I play locally. My tips have only been used on leather boots because my wide feet prevent me from wearing plastic boots with comfort. Wear the boots in the bath for as long as you would bath normally. Wear socks! Both for comfort and realistic size. If you have slighter thicker socks then your normal football socks then choose that option too. In the bath tighten the laces as much as possible. You will need to repeat a couple of times as the leather begins to stretch. When you get out the bath you now have two options, either keep the boots on, or takem off and ABSOLUTELY STUFF your boots with newspaper. Don’t be shy cram it in there! (Personally I only cram the toe area. The rest of the boot I don’t have too many problems with. I tend to try and create height in the toe area as well as width). Whichever option you have opted for you now need to cover the boots in petroleum jelly (aka vaseline). This will keep the boots supple and prevent the leather drying out. Your feet will undoubtly feel uncomfortable and potentially sore during this process but I feel it’s a small sacrifice for beautiful boots. It is very important to keep the leather stretched whilst it dries. Can I put Nike Mercurial Veloce in hot water to break in? No, you shouldn’t use hot water as you may melt the adhesives. We’d suggest wetting the boots, waiting for them to dry out a bit, then wear them for training sessions. You’ll find they mould to your foot better. The key is to get the right size. The rumors about pro’s getting boots a size too small comes from sizing down from a normal pair of sneakers. With normal sneakers people usually want a size up from true to size so you have about a thumb width between the end of your big toe and the end of the shoe. With soccer boots you want true to size, which means your big toe should either touch the end or be millimeters to touching the end of the boot when you are standing up in them. They break in when you start flexing your foot in them. All the excess material starts to mold and wrap around your foot like a glove. They will probably feel tight in the toes until this happens. If they’re comfortable in the toe area while standing when you first buy them they’re probably a little too big. I am a Head Cheer Coach as my mom was when I was growing up for me! My mother use to fill a Ziploc Freezer Bag wit water & place it tightly in my cheer sneakers & put the whole pair of sneakers in the freezer…as the water freezes, it expands & helps stretch out & widen ur shoes…my son starts football this season & I did it wit his new kleets! Hi, I bought a pair of Adidas Predetor LZ, I’ve worn them four times now, three times in training which was about 1 and a half hour long and once in a full 90 minute game but, I’ve still not broken into them! I remember after my training session with them, I got blisters in both of my big toe and on the soles of my feet! Please someone explain why? Thanks! ive broken into my boots fine ( adidas 11Pro Crazylight) but I have noticed after a couple wears the plastic, rubberery tap that connects the actual sole to the leather is wearing away? does anyone know what is actually used to stop this happening?? help!